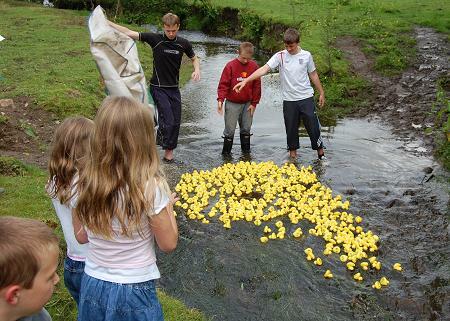 Once each year, rain or shine, we all gather in the meadow by Sowcar brook (off Ingersley Road) for the annual Duck Race! But it’s so much more than just a Duck Race with sideshows, tombola, and burger stands – you will find a whole afternoon’s entertainment, especially for the children! In previous years it has been held in glorious sunshine with a huge crowd attending. More than £2,000 was raised for the Cadets at one event! 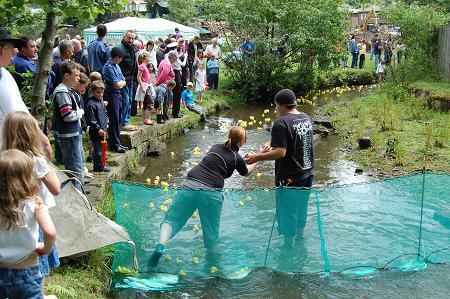 Adult and Children’s Duck Races – BBQ – Refreshments – Stalls and Games. Tickets £1.50p adult ticket and £1.00 children’s ticket. The prizes are £100, £50 and £25 cash for the adult race and £50, £20 and £10 Argos vouchers for the children’s race. In these credit crunch times these prizes in exchange for £1.50p adult ticket and £1.00 children’s ticket is a bargain in addition to a quacking good afternoon out! 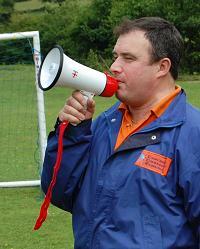 We will be having our usual BBQ, stalls and games and commentary from Canalside Radio.